why aren't you in every bathroom? a haha, as long as she doesn't think she can pee on it. brilliant. i would no longer have to battle maia away from the 'sanitary' box one-handedly. Loves it. 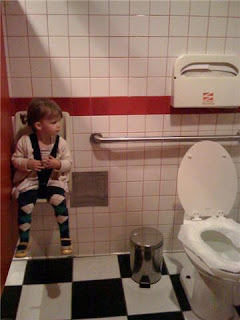 Seriously, how are we supposed to pee in peace when we're scared our toddler is going to make a run for the door and expose us to the entire store/restaurant/office/whatever? Or worse yet, touch that public bathroom floor! i KNOW! 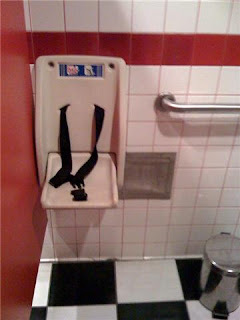 those are the best & barely ANY bathrooms have those chairs...and the kids think it's so fun. it's nice that you can actually do your business without having to stop "mid wipe" (sorry, kinda gross) to stop your kid from attempting to reach into the feminine product little trash can. ewwwww.